Or, just look at the figure below to see that prices might have to drop 30-40% to return to consistency with the long term trend. 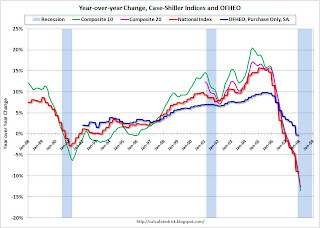 The Case-Shiller national index will probably be off close to 12% YoY (will be released in earlylate May). Currently (as of Q4) the national index is off 10.1% from the peak. To get a feel for the reaction of average Chinese towards criticism from the West, read the excerpt below from a poem now circulating on the internet. (See also video version at bottom.) If you are not familiar with some of the historical references, you might ask someone like Howard Zinn to explain them to you. Most Chinese are incredulous that european colonialists and imperialists, many inhabiting the lands of indigenous people exterminated or displaced only a few centuries ago, would think to assume the moral high ground. ...When we closed our doors, You smuggled drugs to open markets. This NYTimes article and this Time magazine blog post are good examples of how poorly the Chinese worldview is understood here. The poem was erroneously attributed to Dou-Liang Lin, an emeritus professor of physics at SUNY Buffalo. Professor Lin writes that he is not the author and doesn't know who is. Thank you for your enthusiastic praise and support. Several of you have asked for my authorization for translation into Chinese and/or reprinting. Since this was an anonymous poem circulating in the email, I suppose that the author would not mind to be quoted, translated or reprinted. But I was not the author of the poem. Please see below. This is to clarify that the poem circulated in the email recently was not my work. I received it via email last week. There was no author shown. I read it with great interest and was impressed very much. I then decided to share it with my friends through my email network. Apparently some of them forwarded it to their friends, and in a few days, it has reached a large number of readers. Because my email is set with a signature block, some of the recipients assumed that I was the author. This is a misunderstanding and I should not be credited for its success. I appreciate compliments from many within the last few days, but I must say that I am not the one to be credited. I am trying to trace back the email routes to see if I can find the original author. I was informed today that it was also quoted in Wall Street Journal: There has been a poem by an anonymous author circulating in the internet recently. I feel relieved because I was not cited as the author. Thank you for your attention. ...America needs to understand that a hectoring tone evokes in China memories of imperialist condescension and is not appropriate in dealing with a country that has managed 4,000 years of uninterrupted self-government. As a new century begins, the relations between China and the United States may well determine whether our children will live in turmoil even worse than the 20th century or whether they will witness a new world order compatible with universal aspirations for peace and progress. The Financial Crisis: An Interview with George Soros with Judy Woodruff on Bloomberg TV. Judy Woodruff: You write in your new book, The New Paradigm for Financial Markets, that "we are in the midst of a financial crisis the likes of which we haven't seen since the Great Depression." Was this crisis avoidable? George Soros: I think it was, but it would have required recognition that the system, as it currently operates, is built on false premises. Unfortunately, we have an idea of market fundamentalism, which is now the dominant ideology, holding that markets are self-correcting; and this is false because it's generally the intervention of the authorities that saves the markets when they get into trouble. Since 1980, we have had about five or six crises: the international banking crisis in 1982, the bankruptcy of Continental Illinois in 1984, and the failure of Long-Term Capital Management in 1998, to name only three. Each time, it's the authorities that bail out the market, or organize companies to do so. So the regulators have precedents they should be aware of. But somehow this idea that markets tend to equilibrium and that deviations are random has gained acceptance and all of these fancy instruments for investment have been built on them. There are now, for example, complex forms of investment such as credit-default swaps that make it possible for investors to bet on the possibility that companies will default on repaying loans. Such bets on credit defaults now make up a $45 trillion market that is entirely unregulated. It amounts to more than five times the total of the US government bond market. The large potential risks of such investments are not being acknowledged. Woodruff: How can so many smart people not realize this? Soros: In my new book I put forward a general theory of reflexivity, emphasizing how important misconceptions are in shaping history. So it's not really unusual; it's just that we don't recognize the misconceptions. Woodruff: Who could have? You said it would have been avoidable if people had understood what's wrong with the current system. Who should have recognized that? Soros: The authorities, the regulators—the Federal Reserve and the Treasury—really failed to see what was happening. One Fed governor, Edward Gramlich, warned of a coming crisis in subprime mortgages in a speech published in 2004 and a book published in 2007, among other statements. So a number of people could see it coming. And somehow, the authorities didn't want to see it coming. So it came as a surprise. Woodruff: The chairman of the Fed, Mr. Bernanke? His predecessor, Mr. Greenspan? Soros: All of the above. But I don't hold them personally responsible because you have a whole establishment involved. The economics profession has developed theories of "random walks" and "rational expectations" that are supposed to account for market movements. That's what you learn in college. Now, when you come into the market, you tend to forget it because you realize that that's not how the markets work. But nevertheless, it's in some way the basis of your thinking. Woodruff: How much worse do you anticipate things will get? Soros: Well, you see, as my theory argues, you can't make any unconditional predictions because it very much depends on how the authorities are going to respond now to the situation. But the situation is definitely much worse than is currently recognized. You have had a general disruption of the financial markets, much more pervasive than any we have had so far. And on top of it, you have the housing crisis, which is likely to get a lot worse than currently anticipated because markets do overshoot. They overshot on the upside and now they are going to overshoot on the downside. Woodruff: You say the housing crisis is going to get much worse. Do you anticipate something like the government setting up an agency or a trust corporation to buy these mortgages? Soros: I'm sure that it will be necessary to arrest the decline because the decline, I think, will be much faster and much deeper than currently anticipated. In February, the rate of decline in housing prices was 25 percent per annum, so it's accelerating. Now, foreclosures are going to add to the supply of housing a very large number of properties because the annual rate of new houses built is about 600,000. There are about six million subprime mortgages outstanding, 40 percent of which will likely go into default in the next two years. And then you have the adjustable-rate mortgages and other flexible loans. Problems with such adjustable-rate mortgages are going to be of about the same magnitude as with subprime mortgages. So you'll have maybe five million more defaults facing you over the next several years. Now, it takes time before a foreclosure actually is completed. So right now you have perhaps no more than 10,000 to 20,000 houses coming into the supply on the market. But that's going to build up. So the idea that somehow in the second half of this year the economy is going to improve I find totally unbelievable. Woodruff: When you talk about currency you have more than a little expertise. You were described as the man who broke the Bank of England back in the 1990s. But what is your sense of where the dollar is going? We've seen it declining. Do you think the central banks are going to have to step in? Soros: Well, we are close to a tipping point where, in my view, the willingness of banks and countries to hold dollars is definitely impaired. But there is no suitable alternative so central banks are diversifying into other currencies; but there is a general flight from these currencies. So the countries with big surpluses—Abu Dhabi, China, Norway, and Saudi Arabia, for example—have all set up sovereign wealth funds, state-owned investment funds held by central banks that aim to diversify their assets from monetary assets to real assets. That's one of the major developments currently and those sovereign wealth funds are growing. They're already equal in size to all of the hedge funds in the world combined. Of course, they don't use their capital as intensively as hedge funds, but they are going to grow to about five times the size of hedge funds in the next twenty years. Decoherence solved all that! See previous post. 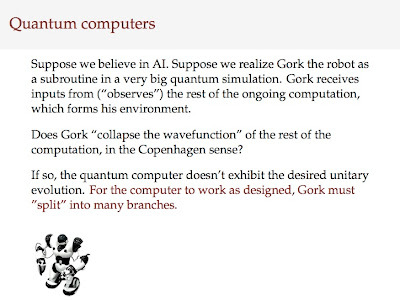 I don't believe that quantum computers will work as designed, e.g., sufficiently large algorithms or subsystems will lead to real (truly irreversible) collapse. Macroscopic superpositions larger than whatever was done in the lab last week are impossible. QM is only an algorithm for computing probabilities -- there is no reality to the quantum state or wavefunction or description of what is happening inside a quantum computer. Stop bothering me -- I only care about real stuff like the Higgs mass / SUSY-breaking scale / string Landscape / mechanism for high-Tc / LIBOR spread / how to generate alpha. A couple of years ago I gave a talk at the Institute for Quantum Information at Caltech about the origin of probability -- i.e., the Born rule -- in many worlds ("no collapse") quantum mechanics. It is often claimed that the Born rule is a consequence of many worlds -- that it can be derived from, and is a prediction of, the no collapse assumption. However, this is only true in a particular (questionable) limit of infinite numbers of degrees of freedom -- it is problematic when only a finite number of degrees of freedom are considered. A historically important but little known debate regarding the necessity and meaning of macroscopic superpositions, in particular those containing different gravitational fields, is discussed from a modern perspective. The discussion analyzed by Zeh, concerning whether the gravitational field need be quantized, took place at a relativity meeting at the University of North Carolina in Chapel Hill in 1957. Feynman presents a thought experiment in which a macroscopic mass (source for the gravitational field) is placed in a superposition state. One of the central points is necessarily whether the wavefunction describing the macroscopic system must collapse, and if so exactly when. The discussion sheds some light on Feynman's (early) thoughts on many worlds and his exposure to Everett's ideas, which apparently occurred even before their publication (see below). Nowadays no one doubts that large and complex systems can be placed in superposition states. This capability is at the heart of quantum computing. Nevertheless, few have thought through the implications for the necessity of the "collapse" of the wavefunction describing, e.g., our universe as a whole. I often hear statements like "decoherence solved the problem of wavefunction collapse". I believe that Zeh would agree with me that decoherence is merely the mechanism by which the different Everett worlds lose contact with each other! (And, clearly, this was already understood by Everett to some degree.) Incidentally, if you read the whole paper you can see how confused people -- including Feynman -- were about the nature of irreversibility, and the difference between effective (statistical) irreversibility and true (quantum) irreversibility. Zeh: ... Quantum gravity, which was the subject of the discussion, appears here only as a secondary consequence of the assumed absence of a collapse, while the first one is that "interference" (superpositions) must always be maintained. ... Because of Feynman's last sentence it is remarkable that neither John Wheeler nor Bryce DeWitt, who were probably both in the audience, stood up at this point to mention Everett, whose paper was in press at the time of the conference because of their support . Feynman himself must have known it already, as he refers to Everett's "universal wave function" in Session 9 – see below. ... Toward the end of the conference (in the Closing Session 9), Cecile DeWitt mentioned that there exists another proposal that there is one "universal wave function". This function has already been discussed by Everett, and it might be easier to look for this "universal wave function" than to look for all the propagators. Feynman said that the concept of a "universal wave function" has serious conceptual difficulties. This is so since this function must contain amplitudes for all possible worlds depending on all quantum-mechanical possibilities in the past and thus one is forced to believe in the equal reality [sic!] of an infinity of possible worlds. Well said! Reality is conceptually difficult, and it seems to go beyond what we are able to observe. But he is not ready to draw this ultimate conclusion from the superposition principle that he always defended during the discussion. Why should a superposition not be maintained when it involves an observer? Why “is” there not an amplitude for me (or you) observing this and an amplitude for me (or you) observing that in a quantum measurement – just as it would be required by the Schrödinger equation for a gravitational field? Quantum amplitudes represent more than just probabilities – recall Feynman’s reply to Bondi’s first remark in the quoted discussion. However, in both cases (a gravitational field or an observer) the two macroscopically different states would be irreversibly correlated to different environmental states (possibly including you or me, respectively), and are thus not able to interfere with one another. They form dynamically separate “worlds” in this entangled quantum state. Feynman: "Don't be so rigorous or you will not succeed." (He explains in detail how he means it.) It is indeed a big question what mathematically rigorous theories can tell us about reality if the axioms they require are not, or not exactly, empirically founded, and in particular if they do not even contain the most general axiom of quantum theory: the superposition principle. It was the important lesson from decoherence theory that this principle holds even where it does not seem to hold. However, many modern field theorists and cosmologists seem to regard quantization as of secondary or merely technical importance (just providing certain "quantum corrections") for their endevours, which are essentially performed by using classical terms (such as classical fields). It is then not surprising that the measurement problem never comes up for them. How can anybody do quantum field theory or cosmology at all nowadays without first stating clearly whether he/she is using Everett’s interpretation or some kind of collapse mechanism (or something even more speculative)? Previous posts on many worlds quantum mechanics. Moody's walks Roger Lowenstein (writing for the Times Sunday magazine) through the construction, rating and demise of a pool of subprime mortgage securities. Some readers may have thought the IMF was exaggerating when it forecast up to $1 trillion in future losses from the credit bubble. After reading the following you will see that it's not an implausible number, and it will be clear why the system is paralyzed in dealing with (marking to market) the complicated securities (CDOs, etc.) that are contaminating the balance sheets of banks, investment banks, hedge funds, pension funds, sovereign wealth funds, etc. around the world. Here's a quick physicist's calculation: roughly 10 million houses sold per year, assume that 10% of these mortgages are bad and will cost the issuer $100k to foreclose and settle. That means $100B per year in losses. Over the whole bubble, perhaps $300-500B in losses, which is more or less what the IMF estimates as the residential component of credit bubble losses (the rest of the trillion comes from commercial and corporate lending and consumer credit). The best predictor, going forward, of mortgage default rates (not just subprime, but even prime mortgages) in a particular region will likely be the decline in home prices in that region. The incentive for a borrower to default on his or her mortgage is the amount by which they are "upside down" on the loan -- the amount by which their indebtedness exceeds the value of the home. Since we can't forecast price declines very well -- indeed, it's a nonlinear problem, with more defaults leading to more price declines, leading to more defaults -- we can't price the derivative securities built from those mortgages. The figure above compares Case-Shiller data on the current bust (magenta) to the bust of the 80s-90s (blue). (Click for larger version.) You can see we have some way to go before all the fun ends. NYTimes: ...The business of assigning a rating to a mortgage security is a complicated affair, and Moody’s recently was willing to walk me through an actual mortgage-backed security step by step. I was led down a carpeted hallway to a well-appointed conference room to meet with three specialists in mortgage-backed paper. Moody’s was fair-minded in choosing an example; the case they showed me, which they masked with the name “Subprime XYZ,” was a pool of 2,393 mortgages with a total face value of $430 million. ...Moody’s was aware that mortgage standards had been deteriorating, and it had been demanding more of a cushion in such pools. Nonetheless, its credit-rating model continued to envision rising home values. Largely for that reason, the analyst forecast losses for XYZ at only 4.9 percent of the underlying mortgage pool. Since even the lowest-rated bonds in XYZ would be covered up to a loss level of 7.25 percent, the bonds seemed safe. In an earlier post I discussed a survey of honors college students here at U Oregon, which revealed that very few had a good understanding of elite career choices outside of the traditional ones (law, medicine, engineering, etc.). It's interesting that, in the past, elite education did not result in greater average earnings once SAT scores are controlled for (see below). But I doubt that will continue to be the case today: almost half the graduating class at Harvard now head into finance, while the top Oregon students don't know what a hedge fund is. NYTimes: ...Recent research also suggests that lower-income students benefit more from an elite education than other students do. Two economists, Alan B. Krueger and Stacy Berg Dale, studied the earnings of college graduates and found that for most, the selectivity of their alma maters had little effect on their incomes once other factors, like SAT scores, were taken into account. To use a hypothetical example, a graduate of North Carolina State who scored a 1200 on the SAT makes as much, on average, as a Duke graduate with a 1200. But there was an exception: poor students. Even controlling for test scores, they made more money if they went to elite colleges. They evidently gained something like closer contact with professors, exposure to new kinds of jobs or connections that they couldn’t get elsewhere. I predict that, in the future, the returns to elite education for the middle and even upper middle class will resemble those in the past for poor students. Elite education will provide the exposure to new kinds of jobs or connections that they couldn't get elsewhere. Hint: this means the USA is less and less a true meritocracy. It's also interesting how powerful the SAT (which correlates quite strongly with IQ, which can be roughly measured in a 12 minute test) is in predicting life outcomes: knowing that a public university grad scored 99th percentile on the SAT (or brief IQ test) tells you his or her expected income is equal to that of a Harvard grad (at least that was true in the past). I wonder why employers (other than the US military) aren't allowed to use IQ to screen employees? ;-) I'm not an attorney, but I believe that when DE Shaw or Google ask a prospective employee to supply their SAT score, they may be in violation of the law. Take with boulder-sized grain of salt. Cause and effect? Only an eight day interval? Couldn't that have been an exceptional period over which aggressiveness paid off? NYTimes: MOVEMENTS in financial markets are correlated to the levels of hormones in the bodies of male traders, according to a study by two researchers from the University of Cambridge (newscientist.com). According to the researchers’ analysis, the men who began their workdays with high levels of testosterone did better than those who did not. As with anything else, when it comes to hormones, it is possible to have (from a trader’s perspective) too much of a good thing. Excessive testosterone levels can lead a trader to make irrational decisions. New Scientist pointed out that although cortisol can help people make more rational decisions during volatile trading periods, too much of it can lead to serious health problems like heart disease and arthritis, and, over time, diminish brain functions like memory. If individual traders are affected by their hormone levels, does the same hold true for the markets as a whole? After all, the market is nothing more than an aggregate of the individual actions of traders. Mr. Coates thinks it is possible that “bubbles and crashes are coming from these steroids,” according to New Scientist. Crossfit: cult or ultimate training? Having played a lot of sports and done a lot of physical training, it's not often that I see something in the gym that shocks me. But recently I came across the Crossfit training system. It's based around short, hyper intense workouts using basic bodyweight gymnastic moves (pushups, pullups, burpees, rope climbing), olympic and power lifts (cleans, jerks, presses, squats) and track sprints and rowing. The goal is to engage the large muscle groups and push them to both anaerobic and aerobic failure at the same time. For experienced athletes, the idea of using olympic lifts for cardiovascular stress training seems over the top, but anyone who can survive this is going to get very, very fit. If you have any athletic background at all (endurance training doesn't count -- it's gotta be something with a little explosiveness and testosterone ;-), watch the videos and tell me you are not freaked out. CFJ: What’s wrong with fitness training today? Coach Glassman: The popular media, commercial gyms, and general public hold great interest in endurance performance. Triathletes and winners of the Tour de France are held as paradigms of fitness. Well, triathletes and their long distance ilk are specialists in the word of fitness and the forces of combat and nature do not favor the performance model they embrace. The sport of competitive cycling is full of amazing people doing amazing things, but they cannot do what we do. They are not prepared for the challenges that our athletes are. The bodybuilding model of isolation movements combined with insignificant metabolic conditioning similarly needs to be replaced with a strength and conditioning model that contains more complex functional movements with a potent systemic stimulus. Sound familiar? Seniors citizens and U.S. Marine Combatant Divers will most benefit from a program built entirely from functional movement. CFJ: What about aerobic conditioning? Coach Glassman: I know you’re messing with me – trying to get me going. Look, why is it that a 20 minute bout on the stationery bike at 165 bpm is held by the public to be good cardio vascular work, whereas a mixed mode workout keeping athletes between 165-195 bpm for twenty minutes inspires the question, ”what about aerobic Conditioning?” For the record, the aerobic conditioning developed by CrossFit is not only high-level, but more importantly, it is more useful than the aerobic conditioning that comes from regimens comprised entirely of monostructural elements like cycling, running, or rowing. Now that should start some fires! Put one of our guys in a gravel shoveling competition with a pro cyclist and our guy smokes the cyclist. Neither guy trains by shoveling gravel, why does the CrossFit guy dominate? Because CrossFit’s workouts better model high demand functional activities. Think about it – a circuit of wall ball, lunges and deadlift/highpull at max heart rate better matches more activities than does cycling at any heart rate. What good is happiness if it can't buy money? 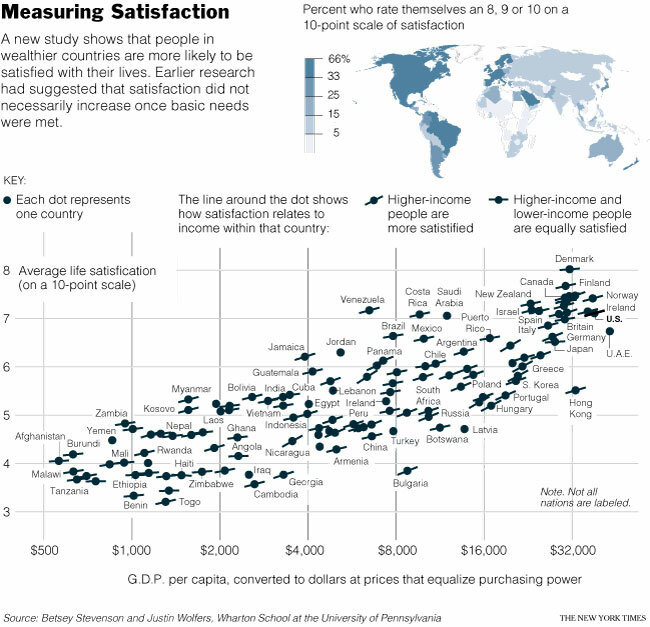 This NYTimes article covers recent results in happiness research, which shows that money does buy happiness after all ;-) The new data seem to show a stronger correlation between average happiness and economic development than earlier studies which had led to the so-called Easterlin paradox. One explanation for the divergence between old and new data is that people around the world are now more aware of how others in developed countries live, thanks to television and the internet. That makes them less likely to be content if their per capita incomes are low (see the hedonic treadmill below). The old data showed surprisingly little correlation between average income and happiness, but 30-50 years ago someone living in Malawi might have been blissfully unaware of what he or she was missing. See the article for links to the research papers and a larger version of the figure. Also see these reader comments from the Times, which range from the "happiness is a state of mind" variety to "money isn't everything but it's way ahead of whatever is in second place." In previous posts we've discussed the hedonic treadmill, which is based on the idea of habituation. If your life improves (e.g., move into a nicer house, get a better job, become rich), you feel better at first, but rapidly grow accustomed to the improvement and soon want even more. This puts you on a treadmill from which it is difficult to escape. The effect is especially pernicious if you adjust your perceived peer group as you progress (rivalrous thinking) -- there is always someone else who is richer and more successful than you are! Note, the hedonic treadmill is not inconsistent with an overall correlation between happiness and income or wealth. It just suggests diminishing returns due to psychological adjustment. John Archibald Wheeler, one of the last great physicists of a bygone era, has died. He outlived most of his contemporaries (Bohr, Einstein, Oppenheimer) and even some of his students, like Feynman. NYTimes: John A. Wheeler, a visionary physicist and teacher who helped invent the theory of nuclear fission, gave black holes their name and argued about the nature of reality with Albert Einstein and Niels Bohr, died Sunday morning at his home in Hightstown, N.J. He was 96. ...One particular aspect of Einstein’s theory got Dr. Wheeler’s attention. In 1939, J. Robert Oppenheimer, formerly the head of the Manhattan Project, and a student, Hartland Snyder, suggested that Einstein’s equations had made an apocalyptic prediction. A dead star of sufficient mass could collapse into a heap so dense that light could not even escape from it. The star would collapse forever while spacetime wrapped around it like a dark cloak. At the center, space would be infinitely curved and matter infinitely dense, an apparent absurdity known as a singularity. Perhaps most important was his work in the 1930's on the endpoint of stellar evolution, with his students Volkoff and Snyder at Berkeley. They explored many of the properties of black holes long before the term "black hole" was coined by Wheeler. Oppenheimer and company were interested in neutron star stability, and gave the first general-relativistic treatment of this complicated problem. In so doing, they deduced the inevitability of black hole formation for sufficiently massive progenitors. They also were the first to note that an infalling object hits the horizon after a finite proper time (in its own frame), whereas an observer orbiting the hole never actually sees the object hit the horizon. The work received amazingly little attention during Oppenheimer's life. But, had Oppenheimer lived another few decades, it might have won him a Nobel prize. More clips from the film. PS Forget about Tibet. The vast majority of (Han) Chinese consider it part of China. Let's restore the Navajo nation to its pre-European contact independence before lecturing China about Tibet. We've had $200B in write-downs so far. The Fed has taken about $300B of shaky debt onto its balance sheet. The IMF is talking about a global bailout of the US economy. It took Japan well over a decade to clean up its banking system after their property bubble burst. I doubt the US is going to take all of its bitter medicine at once. Whither the dollar? Losses from the credit crisis by financial institutions worldwide are expected to balloon to almost $1 trillion (£507 billion), threatening to trigger severe economic fallout, the International Monetary Fund said yesterday. In a grim assessment of the deepening crisis delivered days before ministers from the Group of Seven leading economies meet in Washington, the IMF warns governments, central banks and regulators that they face a crucial test to stem the turmoil. “The critical challenge now facing policymakers is to take immediate steps to mitigate the risks of an even more wrenching adjustment,” it says in its twice-yearly Global Financial Stability Report. The IMF sounds an alert over the danger that banks’ escalating losses, along with credit market uncertainties, could prompt a vicious downward spiral as they weaken economies and asset prices, leading to higher unemployment, more loan defaults and still deeper losses. “This dynamic has the potential to be more severe than in previous credit cycles, given the degree of securitisation and leverage in the system,” the Fund argues. It says that it is clear that global financial upheavals are now more than just a shortage of ready funds, or liquidity, but are rooted in “deep-seated fragilities” among banks with too little capital. This “means that its effects are likely to be broader, deeper and more protracted”, the report concludes. “A broadening deterioration of credit is likely to put added pressure on systemically important financial institutions,” it adds, saying that the risks have increased of a full-blown credit crunch that could undercut economic growth. The report also highlights the threat posed by the rapid spread of the credit crisis from its roots in the US sub-prime home loans to more mainstream lending markets worldwide. While banks have so far declared losses and writedowns over the crisis totalling $193 billion, the IMF expects the ultimate toll to reach $945 billion. Global banks are expected to shoulder about half of the total losses – between $440 and $510 billion – with the rest being borne by insurance companies, pension funds, hedge funds and money market funds, and other institutional investors, predominantly in the US and Europe. Most of the losses are expected to stem from defaults in the US, with $565 billion written off in sub-prime and prime mortgages and a further $240 billion to be lost on commercial property lending. Losses on corporate loans are projected to mount to an eventual $120 billion and those on consumer lending to $20 billion. Alpha magazine has a long article on the current state of quant finance. It may be sample bias, but former theoretical physicists predominate among the fund managers profiled. I've always thought theoretical physics was the best training for applying mathematical techniques to real world problems. Mathematicians seldom look at data, so are less likely to have the all-important intuition for developing simple models of messy systems, and for testing models empirically. Computer scientists generally don't study the broad variety of phenomena that physicists do, and although certain sub-specialties (e.g., machine learning) look at data, many do not. Some places where physics training can be somewhat weak (or at least uneven) include statistics, computation, optimization and information theory, but I've never known a theorist who couldn't pick those things up quickly. Physicists have a long record of success in invading other disciplines (biology, computer science, economics, engineering, etc. -- I can easily find important contributions in those fields from people trained in physics, but seldom the converse). Part of the advantage might be pure horsepower -- the threshold for completing a PhD in theoretical physics is pretty high. However, a colleague once pointed out that the standard curriculum of theoretical physics is basically a collection of the most practically useful mathematical techniques developed by man -- the high points and greatest hits! Someone trained in that tradition can't help but have an advantage over others when asked to confront a new problem. Having dabbled in fields like finance, computer science and even biology, I've come to consider myself as a kind of applied mathematician (someone who applies mathematical ideas to the real world) who happens to have had most of his training from working on physical systems. I suspect that physicists who have left the field, as well as practitioners of biophysics, econophysics, etc. might feel the same way. Readers of this blog sometimes accuse me of a negative perspective towards physics. Quite the contrary. Although I might not be optimistic about career prospects within physics, or the current state of the field, I can't think of any education which gives a richer understanding of the world, or a greater chance of contributing to it. ...Finkelstein, who also grew up in Kharkov, has a Ph.D. in theoretical physics from New York University and a master’s degree in the same discipline from the Moscow Institute of Physics and Technology. Before joining Horton Point as chief science officer, he was head of quantitative credit research at Citadel Investment Group in Chicago. Along with his reservations about statistical arbitrage, Sogoloff is wary of quants who believe the real world is obliged to conform to a mathematical model. He acknowledges the difficulty of applying scientific disciplines like genetics or chaos theory — which purports to find patterns in seemingly random data — to finance. “Quantitative work will be much more rewarding to the scientist if one concentrates on those theories or areas that attempt to describe nonstable relationships,” he says. However, most quant shops aren’t exploring such fields because it means throwing considerable resources at uncertain results, Sogoloff says. Horton Point has found a solution by assembling a global network of academics whose research could be useful to the firm. So far the group includes specialists in everything from psychology to data mining, at such schools as the Beijing Institute of Technology, the California Institute of Technology and Technion, the Israel Institute of Technology. I donated a number of shares in my previous startup (SafeWeb, Inc., acquired by Symantec in 2003) to endow a permanent undergraduate scholarship in memory of my father. In the course of setting up the scholarship I had to assemble a brief bio of my dad, which I thought I would post here on the Internet, to preserve for posterity. The first recipient of the scholarship was a student from Shanghai, who had won a gold medal in the International Physics Olympiad. The second recipient was a woman from Romania. I encourage all of my friends in the worlds of technology and finance to give back to the institutions from which they received their educations. This scholarship was endowed on behalf of Cheng Ting Hsu by his son Stephen Hsu, Caltech class of 1986. It is to be awarded in accordance with Institute policies to the most qualified international student each year. Preference is to be given to applicants from Chinese-speaking countries: China (including Hong Kong), Taiwan and Singapore. Also, preference should be given, if possible, to those with outstanding academic qualifications (such as, but not limited to, performance in national-level competitions in math, physics or computer science or other similar distinction). If the recipient is a continuing (rather than incoming) student, academic qualification can be based on GPA at Caltech, or other outstanding performance (such as, but not limited to, performance on competitive exams such as those in computer programming or mathematics, or outstanding research work). Cheng Ting Hsu was born December 1, 1923 in Wenling, Zhejiang province, China. His grandfather, Zan Yao Hsu was a poet and doctor of Chinese medicine. His father, Guang Qiu Hsu graduated from college in the 1920's and was an educator, lawyer and poet. Cheng Ting was admitted at age 16 to the elite National Southwest Unified University, which as created during WWII by merging Tsinghua, Beijing and Nankai Universities. This university produced numerous famous scientists and scholars such as the physicists C.N. Yang and T.D. Lee. Cheng Ting studied aerospace engineering (originally part of Tsinghua), graduating in 1944. He became a research assistant at China's Aerospace Research Institute and a lecturer at Sichuan University. He also taught aerodynamics for several years to advanced students at the air force engineering academy. In 1946 he was awarded one of only two Ministry of Education fellowships in his field to pursue graduate work in the United States. In 1946-1947 he published a three-volume book, co-authored with Professor Li Shoutong on the structures of thin-walled airplanes. In January, 1948, he left China by ocean liner, crossing the Pacific and arriving in San Francisco. In March of 1948 he began graduate work at the University of Minnesota, receiving his masters degree in 1949 and PhD in 1954. During this time he was also a researcher at the Rosemount Aerospace Research Institute in Minneapolis. In 1958 Cheng Ting was appointed associate professor of aerospace engineering at Iowa State University. He was one of the founding faculty members of the department and became a full professor in 1962. During his career he supervised about 30 Masters theses and PhD dissertations. His research covered topics including jet propulsion, fluid mechanics, supersonic shock waves, combustion, magneto-hydrodynamics, vortex dynamics (tornados) and alternative energy (wind turbines). He published widely, in scientific journals ranging from physics to chemistry and aerodynamics. Professor Hsu retired from Iowa State University in 1989 due to ill health, becoming Professor Emeritus. He passed away in 1996.